This post was originally written in May. I have NO IDEA why it has posted again. Ignore it and I'll do my best to post something new in its place over the weekend. Promise! Time is running out for those of you who have yet to eat at Crackbird, Dublin's very first pop-up restaurant. Open since the 21st of February, this buzzy (and busy) little restaurant on Crane Lane in Temple Bar is going to close its doors and disappear forever on the 22nd of this month. This means you now have only 11 days left to try the tasty chicken and experience the laid-back atmosphere for which Crackbird has quickly become renowned. Run by the same people who are behind the hugely popular Jo'Burger burger joint in Rathmines; the idea behind Crackbird is simple: serve the most ridiculously addictive fried chicken with a range of sides and sauces. I had heard lots of hype about this restaurant before my boyfriend and I visited on Monday and was apprehensive as to whether Crackbird could live up to it. My scepticism deepened as we walked down the dingy side street that is Crane Lane. Had I got the address wrong? The exterior didn't look too promising either. Dark and gloomy, it didn't bode well for what we'd find inside. But once we stepped inside, I found myself getting excited again. 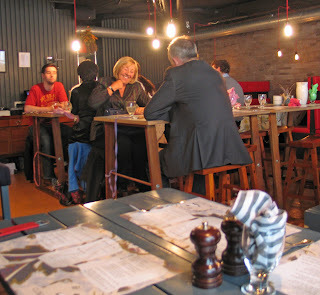 Bare lightbulbs hung over long communal tables lined with smiling people sharing buckets of chicken, salads and dips. The staff - all skinny jeans and quiffs - were friendly and welcoming. And there was music. LOUD music. We ordered the super crisp soy garlic chicken, the semolina chicken crunches, carrot and cranberry salad, chermoula sauce and a whipped feta and burnt lemon sauce with a lime ginger spritzer and a rhubard lemonade to drink. 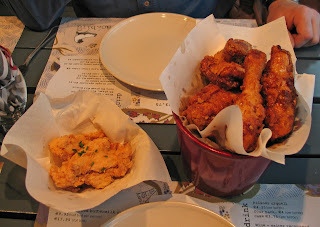 The super crisp soy garlic chicken arrived in a cute little red bucket and was exactly what we hoped it would be. It was so crispy it crunched. It was perfectly seasoned, perfectly spicy and completely addictive. The semolina chicken consisted of strips of moist chicken breast coated in crunchy semolina. It worked well with the herby, zesty chermoula. The carrot and cranberry salad was sweet and fresh and provided a good contrast to the mostly fried food. Finally, the drinks, served in repurposed jam jars, were zingy and refreshing. My verdict? All that apprehension was unfounded. I loved the charming attention to detail - seating composed of picnic benches, homemade napkins in cute patterns, the jam jars for drinks... The food was great. As were the drinks (we didn't have any booze but if we had wanted to, there was beer, wine and cider to choose from). I liked the communal atmosphere and had the sense that we could have stayed there for as long as we wanted, sharing food, sipping drinks and chatting - not something you feel welcome to do in most restaurants. 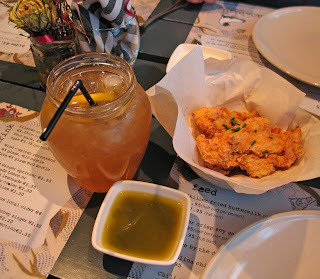 The only negative was that I felt the chicken - the focus of the menu at Crackbird - should have been free-range. The menu tells us that the chicken comes from a cooperative farm in Cavan but I'd have felt happier if animal welfare were more of a priority. Also - and this is going to make me sound SO old - the music was slightly too loud. Those reservations aside, Crackbird is to be recommended. Time is ticking people. 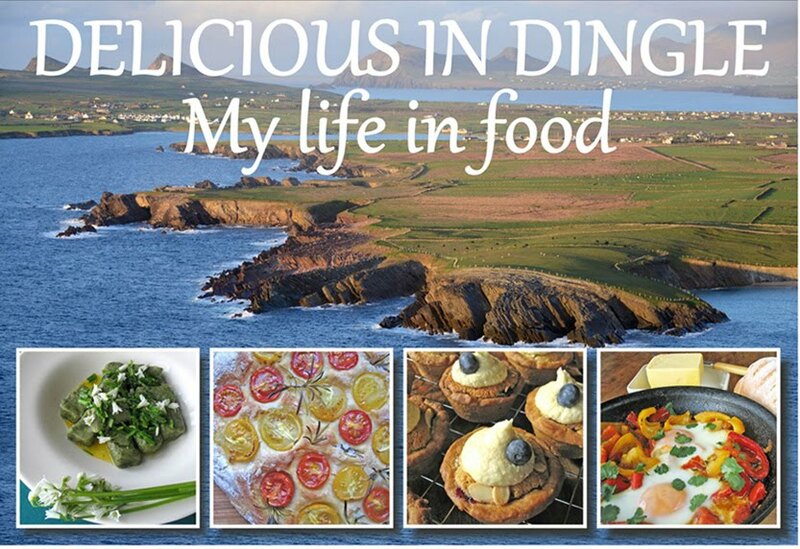 Dublin's very first pop-up restaurant will soon be a thing of the past. Tuck into their chicken dishes, sides and sauces while you still can.